We, together with a number of other friends, joined Catherine and Joe to celebrate their respective birthdays at Kink Bar Boutique - a popular hang-out that we'd never actually visited until the party. Kink is a small bar, with a dark and red Moulin Rouge feel about it... and in fact, at one point I noticed scenes from the movie playing on the projector screen in the photo. We had a couple of drinks inside and then wondered out the front to chat with friends for an hour or two. 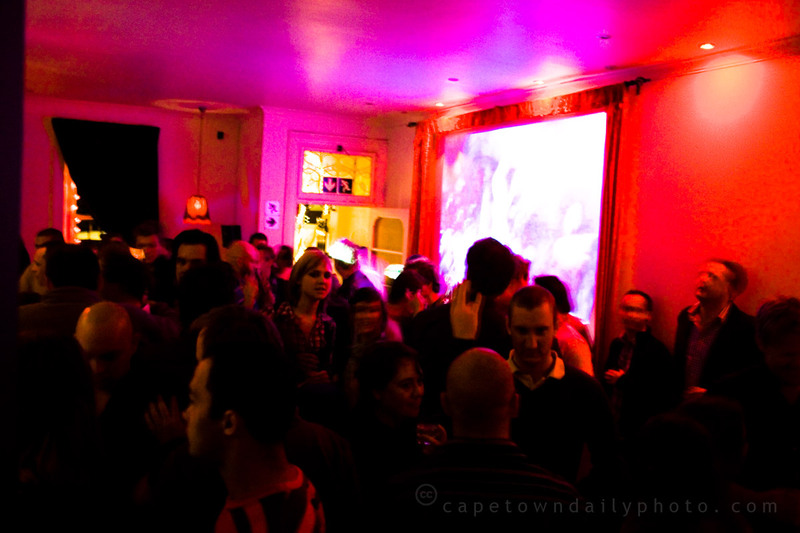 The people enjoying the vibe at Kink seemed unpretentious, friendly and easy to talk to. The girls were pretty, and I'm led to believe that the guys were generally not too bad looking either. :) Even the waitresses mingling through the crowd were friendly and seemed to appear at the right time, just as another drink was required. Kink's a nice place to enjoy a couple of drinks with mates before heading off to one of the local dancing spots. I'm pretty sure we'll be visiting again sometime soon. Posted in Activities and tagged bar, people on Friday, 3 July, 2009 by Paul. Well, we are just back from a couple of weeks at Wittering,on the south coast in the UK, and I am catching up on your lovely Cape Town daily photos and what do I see but our son and daughter-in-laws bar!! I am glad you enjoyed it there and will be on Skype to tell Chris and Gia as soon as I have finished my wander through the last couple of weeks photos and narratives.